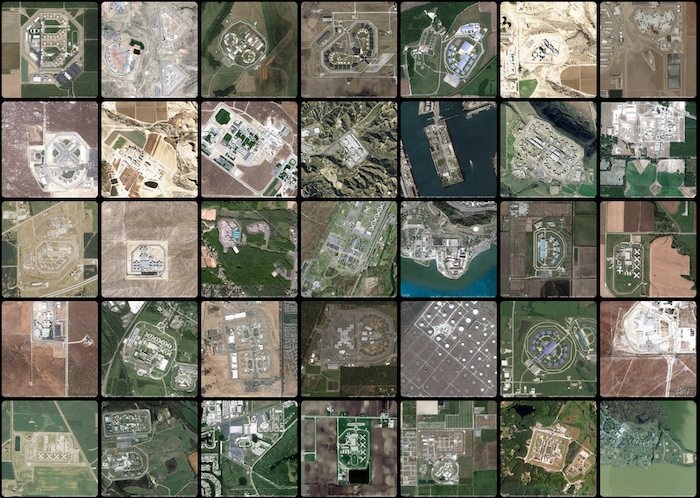 Prison Map is not a map -- it's a snapshot of the earth's surface, taken at various points throughout the United States. It was made by Josh Begley, a graduate student studying Interactive Telecommunications at New York University. The project came about in a Data Representation class with Jer Thorp at NYU. It begins from the premise that mapping the contours of the carceral state is important. A number of people and organizations have done excellent work in this regard. Among them are the Prison Policy Initiative and Prisoners of the Census. Over the past few years, they have culled together a database of seemingly mundane but hard-to-locate information: the latitude and longitude of every carceral facility in the United States (currently with the exception of WA, WV, WI, and WY). Their locator tool, which aims to identify correctional facilities counted in the 2010 census for the purposes of accuracy and redistricting, is the first database I know of to include state and federal prisons alongside local jails, detention centers, and privately-run facilities. You can explore their facility locator here. When using the tool, however, it was hard for me to get a sense of volume -- what does it mean to have 5,000 or 6,000 people locked up in the same place? What do these carceral spaces look like? How do they transform (or get transformed by) the landscape around them? Not all of the coordinates are perfect. Also, because there are so many images, the webpage takes quite a while to load. For this reason, I've only included about 700 (14%) of the best photos. If you want to see the entire data set, you can do so here. Questions or comments? Email me: josh.begley[at]nyu.edu.